The institute is an autonomous regulatory body that recruits personnel in the banking and insurance sectors and also conducts various entrance examinations. “I can say with pride that I’ve been a public sector banker. I’ve had the opportunity and challenge to reach out to the needs of Indians in every corner of the country," says Balachandran, who retired as chairman and managing director, Bank of India, two months ago. Balachandran entered the banking sector when the nationalization of Indian banks, initiated by former Prime Minister Indira Gandhi, was just taking off. “A lot of bright people who had just graduated were recruited by banks, and although I never intended to work at a bank, I took the first job that came my way because, with nationalization, there was a sense that the common man was going to benefit. At least on paper, banks were supposed to provide a new thrust to rural development." He was not entirely disappointed. During the 20 years that he worked at BoB, he served as senior manager, agriculture; chief manager, agriculture; regional manager and deputy general manager, priority sector, working mostly towards making banking effective for farmers and small-scale industries. “When I look back, I get great satisfaction that along with aggressive privatization and globalization of the economy, grass roots development is an area that is being looked at kindly. We tested many of the methodologies that are becoming popular today, such as improving rural credit, 30 years ago," he says. He came to the general banking sector in 1996 when he took over as zonal manager of BoB, Chennai zone, and later moved to BoB, New York, as the chief executive officer. The foundation of Balachandran’s socialist world view was laid during his college days, when he was studying to be an agriculture scientist at the Annamalai University. The green revolution era was at its prime: “My role model was M.S. Swaminathan, the father of the green revolution. I learnt from him that if conservation of natural resources goes wrong, nothing else will have a chance to go right." 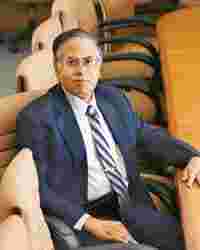 Swaminathan, founder and chairman of the M.S. Swaminathan Research Foundation, is known for introducing and developing high-yielding varieties of wheat in India. Balachandran was ready to take up research in plant breeding and genetics when the interview with BoB came along and he switched tracks. His college days introduced him to a world that was quite different from the one he knew as a child. He studied in a Christian school, and his maternal grandfather was a magistrate in the British era. “From my grandfather, I used to hear many stories about his British bosses. The world of the Raj was in my imagination. Now, when I look back, I realize that although my grandfather used to glorify those days, it was not something he was proud of," he says. His father served in World War II in the postal wing of the Indian Army, but later turned an agriculturist: “My family was not involved in the freedom struggle directly but the nationalist zeal was unavoidable in the 1950s. People talked about Gandhi and Nehru with a lot of emotion." The introduction to the views of Swaminathan was the turning point in his life, when nationalist ideas based on emotions were replaced by pragmatic, sustainable ideas about development. “India’s development is unparalleled in world history, and public sector banks, although they have many gaps to fill, have made precious contribution to it," he says.